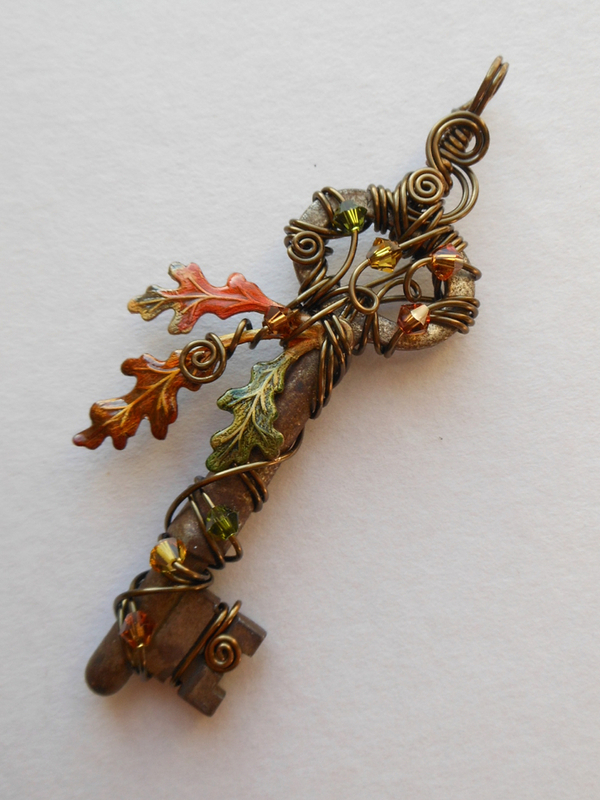 I have dabbled in a large range of crafts — stained glass, enamel, collage, kumihimo, bead weaving — but working with wire captivated me as soon as I began to experiment with it in 2007. In a frenzy of excitement, I wire wrapped all manner of objects I had in my house: shells, stones, beads, and a few old keys I had bought at an antique shop. Other people liked the key pendants as much as I did, so I made more key pendants, and sold them, and made even more, branching out into new ways to ornament them. Keys have a magic to them and a powerful ability to carry meaning, especially when the keys in question have a past history of their own. 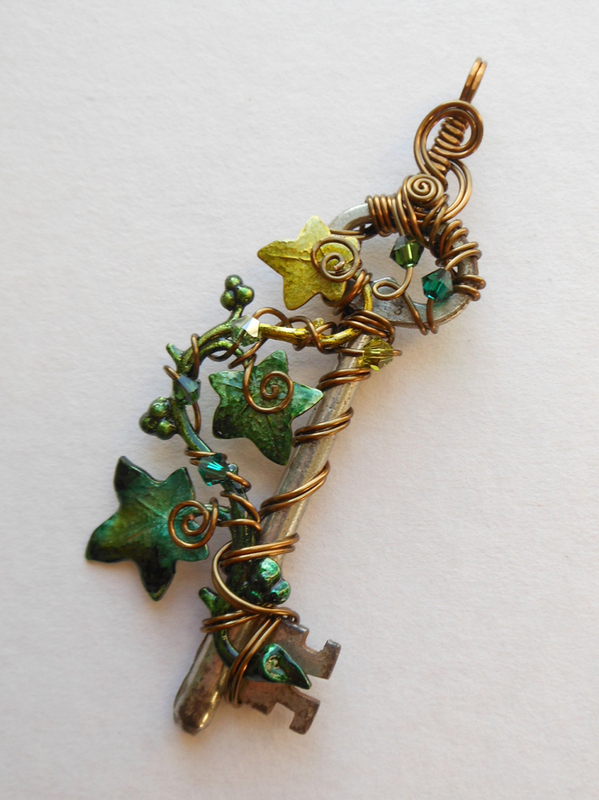 Along with loops and spirals of wire, I decorate my key pendants with gears as if they were tiny machines, or with brass or glass leaves as if the keys have come alive to put out their own sprouts. In 2011 I began to color brass elements to use in my work. In a process of several steps, I blend or overlay multiple colors of alcohol ink and then seal the pieces with layers of weatherproof gloss varnish to give the look of enamels without using a kiln. 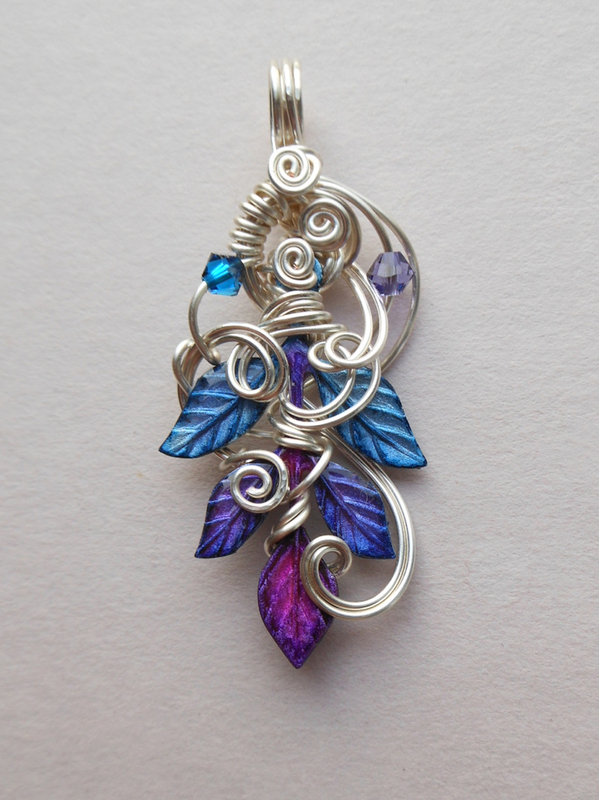 In addition to wire wrapping keys and sculpting wire pendants, I create wire filigree earrings and pendants, braided wire bracelets, and woven wire necklaces and pendants. There are so many potential techniques using wire that I believe I may work with wire for decades and never grow bored. I look forward to increasing my range of techniques and materials, adapting new elements to my own style.